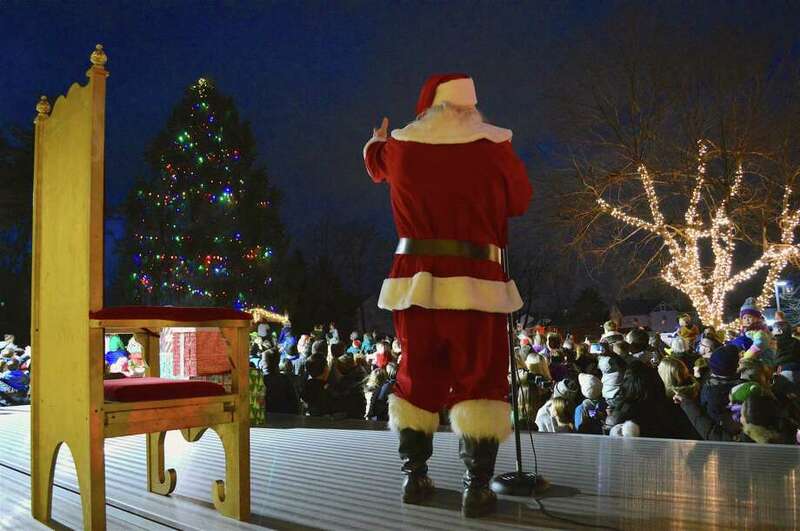 Santa lights the trees at the 40th annual Darien Sport Shop tree lighting and visit from Santa Claus on Sunday in Darien. DARIEN — ’Twas a month before Christmas, but here in this town, the people rejoiced to have Santa around. On Sunday evening, Darien Sport Shop hosted its 40th annual tree lighting and St. Nick visit in the Leroy Avenue parking lot, this year assisted by the Parks and Recreation Department and members of the Boy Scouts. “After hearing the tradition behind this one, we decided to partner with them,” said Jami Dawson, Parks and Recrecation program supervisor, whose department is also going to host a holiday event at Tilley Pond Park on Dec. 15. Along with performance by the Darien High School’s Tudor Singers, there were snacks and celebration amid hundreds of residents. As usual, Santa came by firetruck and stayed until the very end, giving each child a chance to share their wish lists.